Phyto is a prefix derived from Ancient Greek and means “derived from or pertaining to plants”. 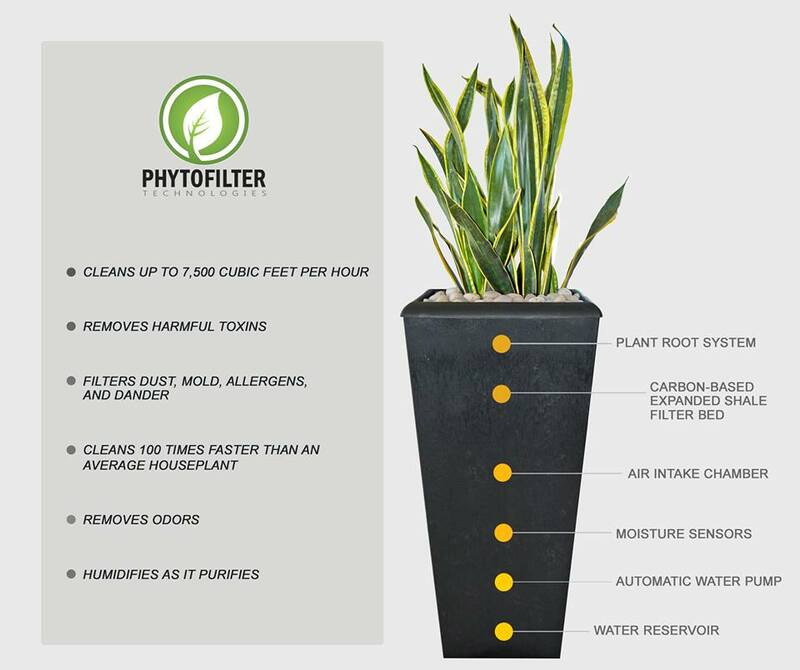 Plants are nature’s natural purifiers, nature’s natural filters of airborne pollution; hence our name, Phytofilter Technologies, Inc.
Plants purify the air. They absorb many airborne pollutants through their leaves, break them down and/or transport them down through their stems and excrete them through their roots systems. Microbes, living on and around the plant roots, break down pollutants as well and turn them into food that the plants than absorb. By using both plants and microbes within an air purification system, airborne toxins, or volatile organic compounds (VOCs), are not only captured but transformed naturally into a useful and harmless substance that the plants remove from the environment. PhytoFilter Technologies NASA inspired design takes this proven purification system one step further, introducing a magnified airflow and replacing traditional soil with a much more porous substitute. The result of these modification is dramatic, giving a single plant the cleansing capacity of what would have traditionally taken a hundred! Now while everyone wants clean, fresh, healthy air not everyone wants to maintain there PhytoFilter. That is why PhytoFilter Technologies has incorporated a monitoring and maintenance system within each PhytoFilter. No need to worry about when to water, or turn on and off your PhytoFilter our patented technology takes all the guess work out of the equation! SO WHY NOT JUST STICK WITH YOUR TRADITIONAL AIR PURIFIER? Mechanical purifying systems do one of two things: (1) they trap pollutants within a filter bed or bag that eventually becomes saturated and has to be replaced in a few months or (2) they zap pollutants and the air around them with ions or electrons which causes a change in their molecular structure, turning them into something often more toxic than before. PHYTOFILTER’S NEVER NEEDS REPLACEMENT FILTERS! Since PhytoFilter Technologies air purification system uses both plants and microbes, it has little need of a filter replacement since these living entities digest what is there. Harmful compounds are broken down naturally and utilized, rather than build and accumulate like within a traditional filter. The system requires little or no maintenance. It causes no known health risks to the user. Phytofilter Technologies Inc, will soon be manufacturing a variety of products that are designed to eradicate indoor air pollution. America’s Number One Environmental Health Concern according to the EPA, responsible for 50% of the illness in this country. Phytofilter Technologies works with nature and not against it to solve the world’s airborne problems. Through its use of plants, it epitomizes what going green is all about. Phytofilter technology has even improved on nature, by enhancing a plant’s power to purify the air by more than a hundred fold. The firm’s products lower energy needs, reduce pollution, and increase our feeling of well being. They reduce stress and bring us peace of mind. Phytofilter Technologies, Inc. takes a holistic approach to the airborne problems of the world. Copyright (c) 2013 Phytofilter.com. All rights reserved.